you place the flowers in the vase that you bought today." Our house is kinda full today. For a very good reason. Thing #3 graduates from high school. Pretty soon she will be flying the coop too, just like Things #1 and #2. But for now? My house is a very, very, very fine house. Two dogs in the yard. Everything is easy 'cause the family is all here. Celebrating. La, la, la, la. All links that do not meet those criteria will be deleted. Links from blogs, Instagram, Flickr are all welcome. As always, thank you so much for stopping by, commenting, joining in (any or all of the previous)! All are appreciated. Please take the time to visit some of those who join in here at Song-ography. I will be by to visit every one's posts. Phew - lucky me for today that it is not the 1st Tuesday of the month, otherwise... I would not have made it :) But I did, finally. I'm not sure I "played along" correctly, only using the song title in my blog title. Let me know! I always love it when everyone's home too but I'd be using Madness "our house in the middle of our street" fa la la la la! What a wonderful idea to link a photo with lyrics of a song. I gotta try this for future posts! Hope she made it to graduation!! Gorgeous picture and a great song. Congratulations on Thing #3's impending graduation. Love this song and photo! Beautiful shot and post! Congrats to Thing #3 and you, mama for getting all three of them there! I can feel your joy exuding from you all the way over here in Michigan! LOVE having our chillun's home, don't we? But then - it's nice to have "our space" & routine back too. Congrats on the final high school graduation - you deserve a glass of wine.......or beer! Pretty pic..........you can rest tomorrow. Hey, I have that same pitcher! Now I wish I had some peonies to put in it. Love your photograph! I joined your link-up! Rare of me, huh? But I hope to do so more often. yay!!! 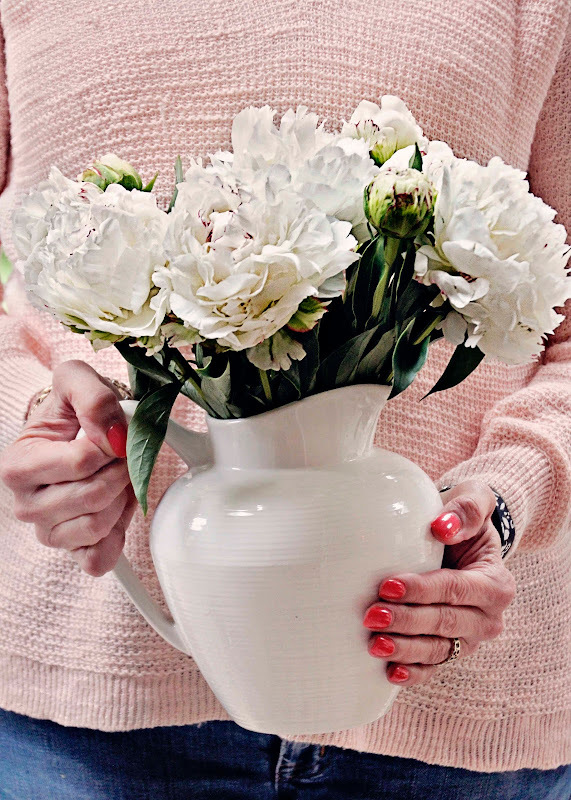 I love the close-up of the sweater more than the gorgeous blooms. Great compromise! Your houseful sounds wonderful and congrats on Thing 3's graduation! You all have had a lot of changes over the last year or so! A perfect song choice. To think there were times when we would give anything for a moment of peace with kids screaming, running in and out the door, leaving the bathroom looking like it had been raided by a band of banshees. I sleep better, breathe better, and smile more when my munchkins are both home. One of my favorite all time songs… beautiful flowers too! Great song choice and lovely photo.